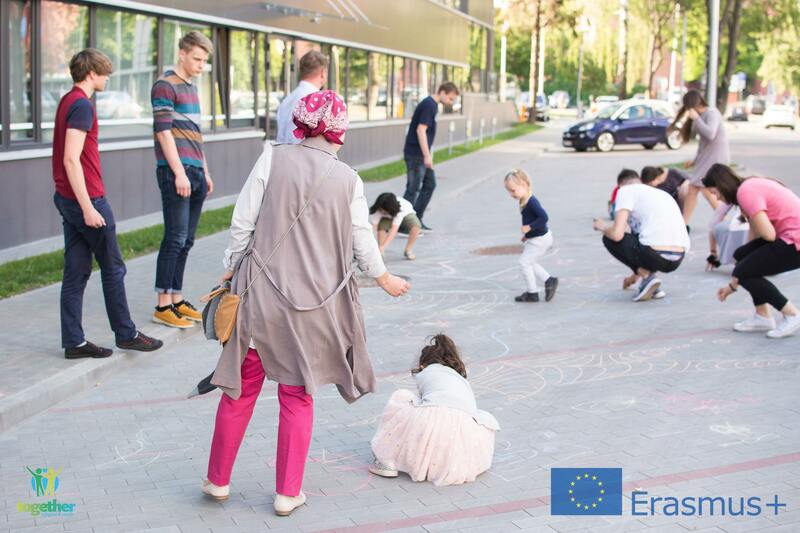 Last Wednesday, in a mystical place, called Ūksmė, refugees and youth had an opportunity to delve into art of … Art! Sounds strange at first, but the more you try to understand, the more amazing it sounds. Participants had absolute freedom in painting on the sidewalks with chalk, using markers on the walls and using crayons and other means possible to unleash their creativity. While some of the people were discovering (and even rediscovering) their inner artist, on the other side of this mystical place, other part of the participants were being taught how to dance traditional, POP and Salsa dances and being introduced to the magic of dancing. Participants felt like they have become one with the environment and didn’t want to leave it even after the event has ended. You could still see some of the people painting each other faces on the glass walls and sounds of Lindy Hop could be heard from inside the dancing room. Here you can check all the amazing pictures of the event! Stay tuned on our FB page for more amazing experiences.